Gov. Scott Walker signed legislation last week to lower the wages of Wisconsin’s middle class workers. He wants pay cuts for hard working Wisconsinites. It’s part of a pattern established by Wisconsin’s Republican governor and the Republicans who control the state legislature. Earlier, they slashed the paychecks of teachers and government workers by 8 to 10 percent. Wisconsin Republicans refused to raise the minimum wage for workers who haven’t seen an increase in six years, even as 29 states gave raises to the lowest paid. Meanwhile, Walker and his GOP gang butchered state funding for public schools and propose the same fate for the state’s public universities – the colleges that, until now, the middle class could afford. For putting the squeeze on workers, Walker is the darling of the GOP. In some polls, the college dropout is their leading candidate for the presidential nomination. His Mitt Romney-like hatred of the 47 percent, the working poor and organized labor is so GOP-revered that freshmen Republican governors like Bruce Rauner of Illinois are aping his efforts to shove workers down. Photo by Rob Chandanals on Flickr. 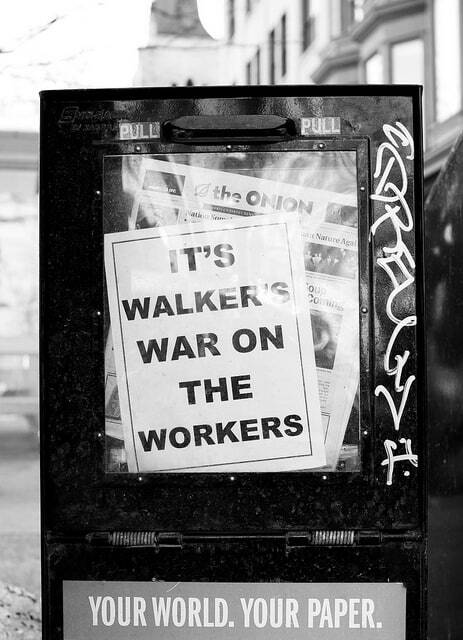 The legislation Walker signed last week is called right-to-work-for-less. That’s because workers in states with these laws are paid $1,500 a year less. Wherever Republicans control a house of a state legislature, they propose it. After Republicans won majorities in both houses in West Virginia for the first time in eight decades, the GOP immediately introduced right-to-work-for-less legislation. GOP Gov. Rauner, a billionaire, tried to circumvent Illinois’ Democrat-controlled legislature by imposing right-to-work-for-less on government workers by executive fiat. Every adult American, of course, has the right to work. What this legislation does is help corporations and state governments cut workers’ pay. Its intent is regressive. Republicans want to return America to the days when robber barons controlled workers’ lives completely. This was a time of grotesque income inequality, of child labor, of tragically unsafe workplaces, of bosses compelling workers to remain on the job 50, 60 even 80 hours a week with no overtime pay. American workers already are suffering the worst income inequality since the Great Depression. Right-to-work-for-less laws worsen that. These statutes forbid employers and labor organizations from negotiating collective bargaining agreements requiring all workers to pay either fair share fees or union dues. At workplaces where employees have chosen union representation, federal law requires the labor organization to act on behalf of all of the workers, whether or not they join and pay dues. Fair share fees, which are less than dues, cover costs such as bargaining contracts that benefit all workers and representing workers who haven’t joined the union but want it to file grievances for them against the company. Right-to-work-for-less laws are intended to bankrupt unions. And they do. In Wisconsin four years ago, before passage of right-to-work-for-less legislation for government workers, Council 40 of the American Federation of State, County and Municipal Employees (AFSCME), representing county and municipal workers, received dues or fair share payments from 32,000 workers. Now, Council 40 gets dues from 13,000. That cut nearly in half the funds it has to represent all 32,000 workers. As reduced income diminishes the AFSCME Council’s ability to do that well, more workers may quit and stop paying dues. That’s the death spiral Republicans are seeking. Wisconsin unions representing workers at private companies face that same fate as a result of the new right-to-work-for-less legislation that Gov. Walker signed last week. Right-to-work-for-less laws take from workers the tool they used for decades to secure better wages and working conditions. Right-to-work-for-less sends workers back to the desperate days before 1935. That’s the year Congress passed the National Labor Relations Act encouraging collective bargaining. For nearly four decades after President Franklin Delano Roosevelt signed the act, union membership grew, America’s middle class blossomed and income inequality shriveled. For the past three decades, as Republicans attacked workers’ right to collectively bargain for better lives, union membership shrank and workers’ wages stagnated. Now, income inequality is back to robber baron levels. While the GOP attacked unions, Republicans like Walker and Rauner wounded the working poor and middle class in other ways as well. They cut funding for public transit, day care and unemployment insurance. They slashed spending for public education from Florida to Oklahoma to Arizona. Now, GOP governors are demanding hundreds of millions in cuts to the public universities attended by the children of America’s middle class. Rauner wants to take $400 million from the University of Illinois. Walker wants to slash $300 million from the University of Wisconsin system. Arizona’s Republican Gov. Doug Ducey wants to carve $75 million out of his state’s universities. The result is that while workers get paid less, they’re shelling out more to buy bus tickets to their jobs, to ensure that while they work their toddlers are safe and to give their kids a college education. This is the GOP’s big squeeze. It means the death of opportunity for the working poor to climb into the middle class. It means more of the middle class dragged down into poverty as workers scramble to pay ever-climbing bills with ever-smaller paychecks. Unions and progressive groups are fighting back. Unions, including the United Steelworkers, have filed lawsuits in Wisconsin and Illinois to try to reverse right-to-work-for-less in those states. And a coalition of progressive groups and social welfare organizations staged protests last week across the country under the banner: “We Rise.” They’re demanding politicians put people and the planet first – that is, before the greed interests and ecological disinterest of Republicans and big corporations. They refuse to be strangled by the GOP.